POCUS Evidence Atlas - OB GYN ectopic pregnancies and pregnancy. 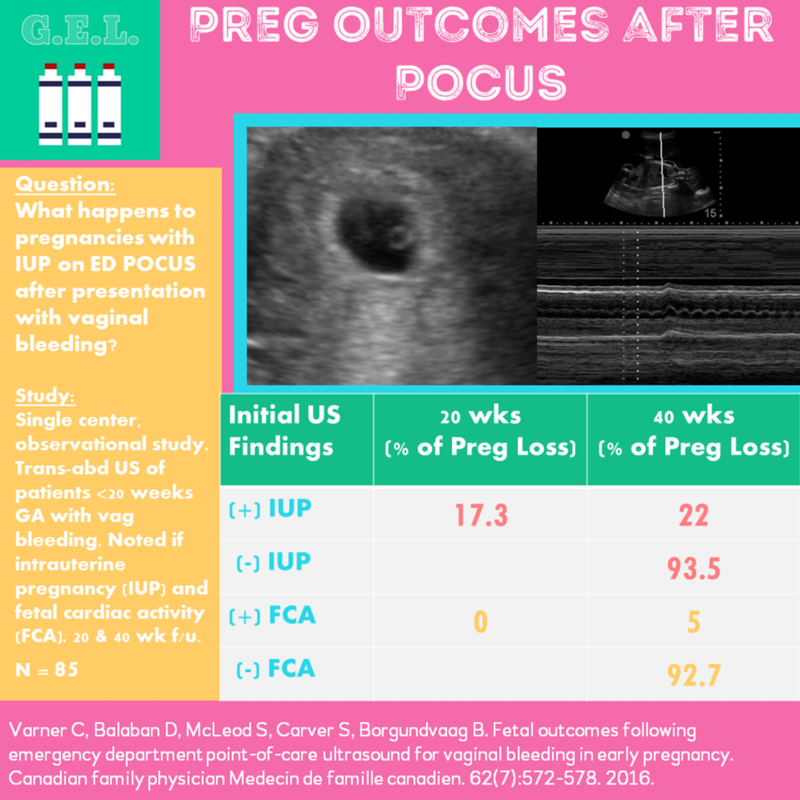 EBM review and resource of POCUS for ectopic pregnancy positive fast exam diagnosis. Sensitivity Specificity positive and negative likelihood ratios. This was a meta-analysis including 10 studies (n=2057) examining the operating characteristics of bedside emergency provider (EP) performed ultrasound to rule out ectopic pregnancy. All studies used the visualization of an IUP (intrauterine pregnancy) on ultrasound as the rule out criteria. The ultrasound examinations performed by EPs included transabdominal, transvaginal or both. Reference standards included formal radiology US, gynecology US, over-read of EP performed US by radiology, or clinical record review. They did not report specificity and positive LR's because of significant heterogeneity in these results when data was pooled. This study supports the utility of EP performed ultrasound as a strong rule out test for ectopic pregnancy. This was a prospective observational study (n=242) of patients presenting to the emergency department with suspected ectopic pregnancy, evaluating if free fluid in the peritoneal cavity identified by bedside ultrasound was predictive of the need for operative intervention. The included patients were suspected to have an ectopic pregnancy based on positive pregnancy test results, in their first trimester, with either abdominal pain or vaginal bleeding. All examinations were performed by emergency providers (EPs) using a transabdominal approach, to determine if free fluid was present in the hepatorenal space (Morison’s Pouch) and/or pelvis. Reference standard was chart review by one of four study investigators who were blinded to the EP performed US results. There was one patient who had free fluid in Morison’s Pouch but had a confirmed IUP (suspected to be a ruptured corpus luteum cyst) and no ruptured ectopic pregnancy. This study supports that free fluid present in Morison’s pouch in patients with suspected ectopic pregnancy strongly predicts the need for operative intervention.